BMW says its eight-speed automatic is more efficient than a dual-clutch unit. MUNICH -- Klaus Draeger, BMWs development chief, is turning to automatic transmissions and away from dual-clutch assemblies for the automakers high-volume model lines. 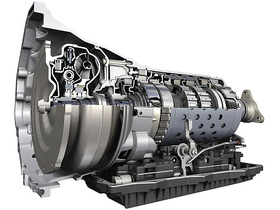 Draeger said dual-clutch transmissions are complex, expensive and heavy, especially for cars with longitudinally mounted engines and rear-wheel drive. BMW offers dual clutch transmissions in sporty versions of its 3 Series coupes and the Z4 Roadster. ZF Friedrichshafen designed the eight-gear automatic for cars with rear- and all-wheel-drive. Later this year, the transmission will go into BMW and Audi vehicles. It also features an optional start-stop system.